elink is a visual collection of links that can be shared as an email newsletter, embedded on a blog/website or shared as a web page. You can think of it as a professional Pinterest, where you are not just creating visual boards but you can actually share your collection of links in multiple formats. Click here to see an example of an elink collection. elink is for anyone who wants to collect and share multiple links (digital content) with clients, followers, colleagues, students, in a professional way. It's a beautiful, smart & fast way to share information around a particular topic, personalize it and share it with the world. Users in over 100 countries rely on elink everyday to create content and share with others. Our users range from marketers, teams of all kinds, influencers, bloggers, researchers, governments, educators, non-profits, etc. Collectively they are creating thousands of elink collections a week. How to Create an elink collection? Elink is one of the easiest platforms you will use. To get started simply follow the steps below once you sign in. Click on Create New from the dashboard. Scroll through all of the layouts and choose a layout. Free layouts are available to users on all plans. PRO layouts are an extensive collection of beautiful responsive modern layouts. The only way to access all of these layouts is to upgrade to the PRO plan. Once you select your layout start by adding your links. 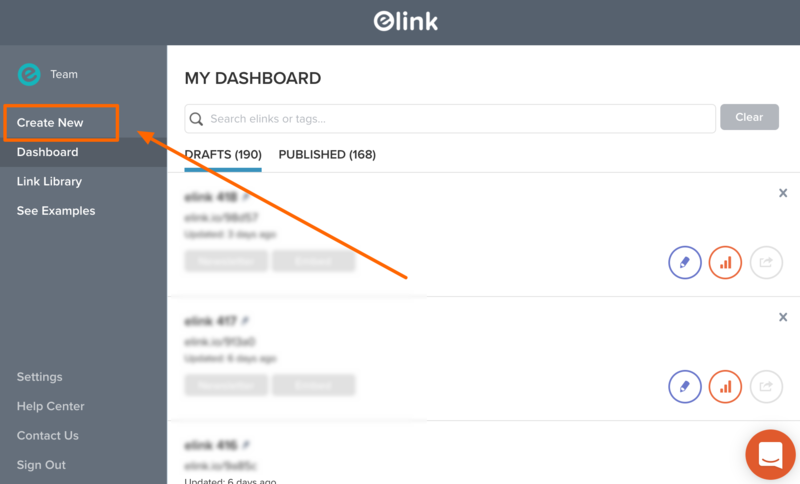 You can as add as many links as you want in your elink collection. As you add links, you will start seeing your content appear immediately in the same layout that you selected. You can even change the image of the links you add and even change the title and description to add your own voice. To learn more about how to edit web link information click here. Once you are done adding your web links click on next and select Header 1. Once you are done customizing your header click next and you will come on your profile section. elink.io allows you to add your brand information at the top of your web page, web content and newsletter by add a profile. Your brand profile contains an image (logo or headshot), name, tagline, weblink and social media sites. You have the option of adding your brand profile on any of the elinks you create. Once you are done adding your profile, click next and you will be taken to the last step where you get to publish your elink collection so you can share it. You can decide if you want to make this elink collection search engine friendly or not and customize your primary link color, and then click on create my elink button. Now you are ready to share your elink collection as a web page, newsletter or embed it on your website! To learn more about sharing elinks as an email newsletter go here. To learn more about embedding elinks on your website go here.